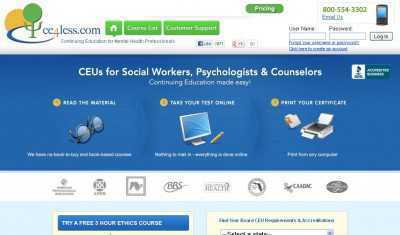 Ce4Less.com offers continuing education programs for social workers, psychologists and counsellors. These are all available online – there’s no books to buy, and nothing to mail in. Everything’s done on your browser, and once you have completed your course then you won’t even have for the company to send you a certificate. No, you’ll print it yourself. You won’t have to wait a single day once your course is over to get your diploma, you’ll have it in your hands as soon as you finish the last lesson. The courses that are available on CE4Less.com can be browsed both by State and by profession, as it’s only suitable – CEU requirements and accreditations are different from one place to the other. You can pick the State where you live in and your profession from two drop down menus that are available on the homepage. All in all, both the continental and the non-continental US are covered, and you can choose from any of the following six professions: “Psychologist”, “Social Worker”, “Counsellor”, “MFT”, “Drug/Alcohol Counsellor”, “Nursing” and “CNA”. A tiered approach to pricing means that you can access all of CE4Less courses for $74.99 for one year, whereas $129.98 buys you two full years of continuing education. 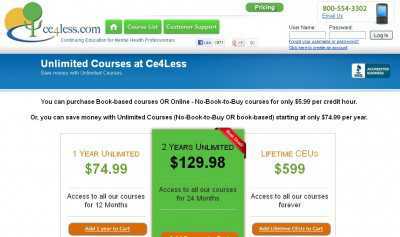 And you can access all of CE4Less.com courses forever by paying $599. 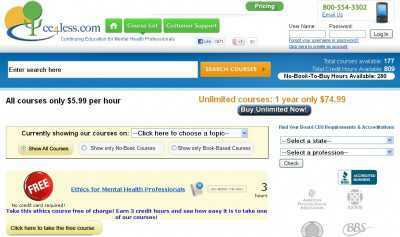 So, the site is one that both new and seasoned mental health professionals are going to find well-suited to their needs.